All respected and recognised characteristics of a quality New Holland product is presented in the new T8 Series tractor line. Unique features that increase productivity, power, stability, manoeuvrability and fuel efficiency are all fused into this unique tractor line. 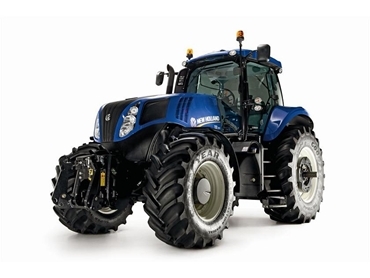 All T8 tractors come with the new New Holland's EcoBlue Tier 4 engine solutions. Cursor 9 Selective Catalytic Reduction (SCR) engines reduce emissions and breathe clean air to maintain excellent combustion and performance. The Engine Power Management which all models feature offers more power for PTO, transport and hydraulic applications. The power management also allows T8 tractors develop more torque and power as they are put under load. With the longest wheelbase in the industry, the T8 tractors redefine the industry’s comfort and stability standards with their revolutionary long-wheelbase design whilst maintaining top manoeuvrability in their class with the new sculpted frame design. Ideal for secondary cultivation, drilling, spreading and transport applications, the T8 tractors are purpose built for heavy tillage and embody a front hitch and PTO options that allow a full range of font-mounted accessories. Compared to the existing Tier 3 models, operating costs of the T8 tractors are reduced by 10% when used with EcoBlue. Thanks to the cutting- edge SCR technology, improved fuel efficiency and long service intervals.